History suggests that the most critical aspect of policing is weather complainants or victims of crime get the real justice, when he or she has been wronged. The trend in the country is embarrassingly low with many police cases struck out in court and conviction of the cases to the courts embarrassingly low. 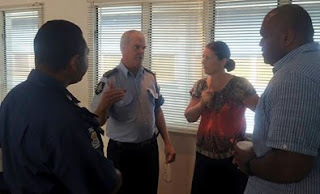 As a result the Australian Federal Police (AFP) through the PNG Australia Policing Partnership are currently conducting a one week workshop for Port Moresby’s police force CID and a scope of training commandants at Boroko in what is being labelled as the Investigative Interview workshop headed by Chief Superintendent Training Commander for Bomana Police College, Perou N’Dranou to assist Officers in Charge (OIC) and Police Station Commanders (PSC) understand effective investigation processes and the methodology to investigate and manage investigation that falls in their areas of responsibility. “Previous cases has demeaned and encrypted numerous failed investigations plus a wastage of funds which denounced a much needed training to be conducted, therefore, the workshop prominently is to adhere to a cohesive training conduct between the AFP and PNG Police Force, aiming at enhancing and equipping local police prosecutors with improved knowledge and skills in order for them to carry out intensive investigative processes and also to know what is expected from them (Police) upon cases going to the courts,” said Chief Superintendent N’Dranou. According to Superintendent N’Dranou, every police personal should attend the workshop, learn and practice what would be taught throughout the workshop so that that they acquire adequate training and practise best investigative methodologies.